Below you can find additional resources that may not have been able to be fit into our other content! Please let us know if there is anything you would like to see, or if you have resources to contribute! To view the complete webinar and access relevant files, please visit http://www.aivrttac.org/webinars! The AIVRS Success Wheel was designed by Suzanne Malson, M.S. and is based around the idea of the medicine wheel, a symbol of life and healing honored by many American Indian and Alaska Native Tribes. The AIVRS Community Diagram was designed by Suzanne Malson, M.S. The diagram, “Community Partners” is an attempt to provide a visual to demonstrate how the American Indian Vocational Rehabilitation Services (AIVRS) Program incorporates partners into a consumer’s journey and into their Individualized Plan for Employment. 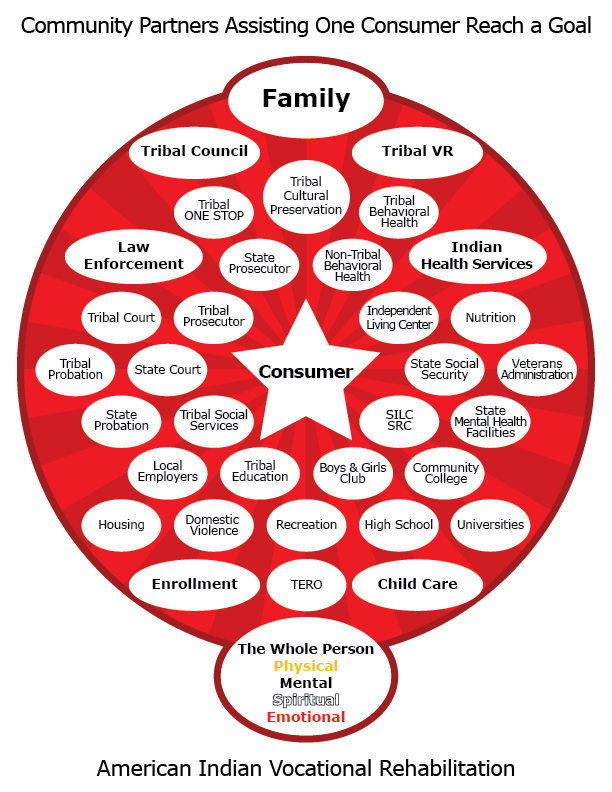 Observe, the consumer is in the middle of the circle diagram, the family is at the top, (north) of the circle in a prominent role with Tribal Council and Tribal VR underneath family, and the AIVRS philosophy is at the bottom (south) of the circle. The philosophy of AIVRS is holistic in nature with the goal to recognize the whole of a person, the physical, mental, spiritual, and emotional and thereby, serving all the needs in the human condition. The stakeholders listed in this diagram may change within each Tribal community; consequently, each community diagram will be unique to that community. Consider the multiplicity of services that is required to help one Tribal member with a disability reach their personal and professional goal of obtaining and maintain a full time employment position. Reflecting on this circle diagram of partners, how would you change this diagram to demonstrate an AIVRS Program circle of community partners of influence? Who are the major players, such as, the Rehabilitation Services Administration, Tribal Government, CANAR members, and other stakeholders? Where is your consumer in your circle diagram?